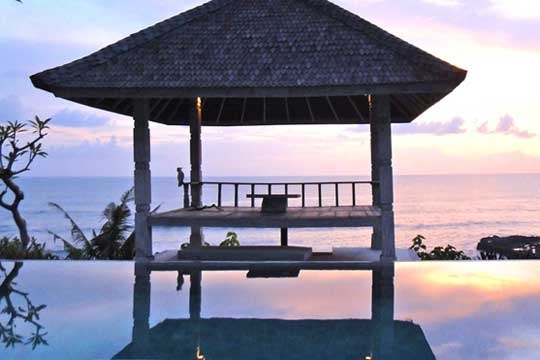 Absolutely beachfront and blissfully far-flung with 360-degree views of the ocean, mountains and rice fields, the 6-bedroom Villa Sunset is part of the small Kembang Desa Villas enclave. 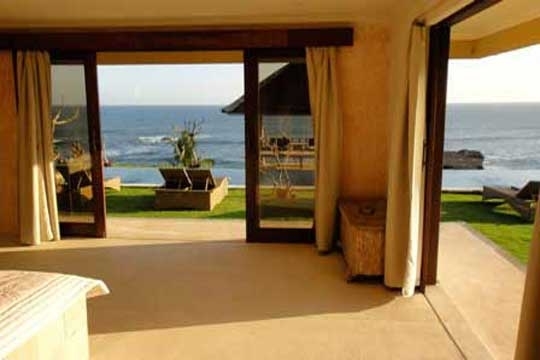 With open-air terraces, cliff-top garden, 17m pool, and self-contained guest house, this villa is perfect for families and those who love nature. 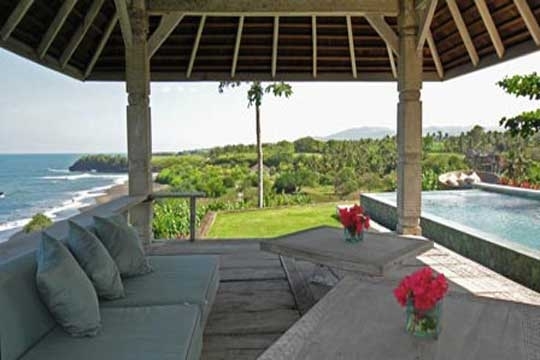 Standing proud upon a headland above a deserted black-sand beach in Bali’s remote Tabanan Regency, the six-bedroom Villa Sunset offers comfort, romance, and service from the heart wrapped up in spellbinding views of the mountains, the rice fields and, as the name suggests, spectacular sunsets over the sea. 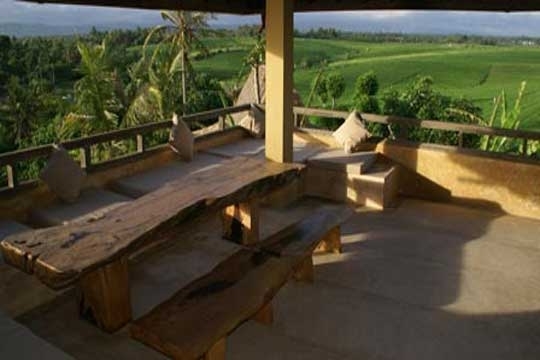 Villa Sunset is a contemporary-rustic two-storey house, complemented by a 100-year-old timber guesthouse. Open to the views and the sea breezes that whisper across its terraces, the style of the main building embraces thick polished concrete walls characterised by arches, sculptured built-in sofas, antique Indonesian doors and romantic open-air bathrooms. 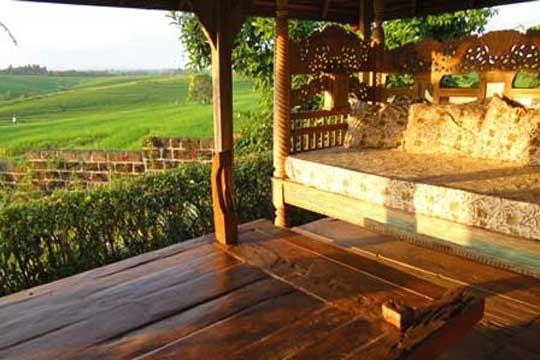 Wooden furnishings are custom-designed and decorated with traditional Timorese carvings; a bench seat at an alfresco dining table, for example, is crafted in the shape of a horse’s head. 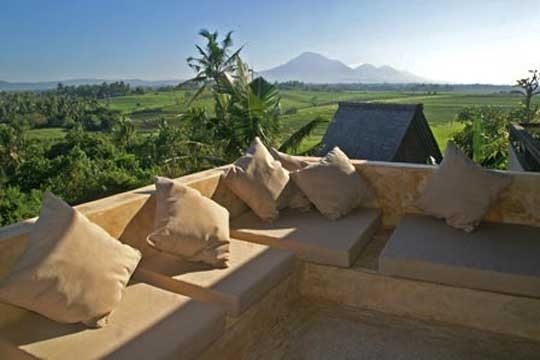 The colour theme, meanwhile, presents neutral earthy tones, ensuring that nothing detracts from that fabulous, awe-inspiring vista, which encompasses Bali’s chain of mountains from the majestic Mt Agung in the east to Mt Batur, Mt Pohen, Mt Sangkiang, and Mt Batukaru, rising from the foothills just 20km away and dominating the northern skyline. 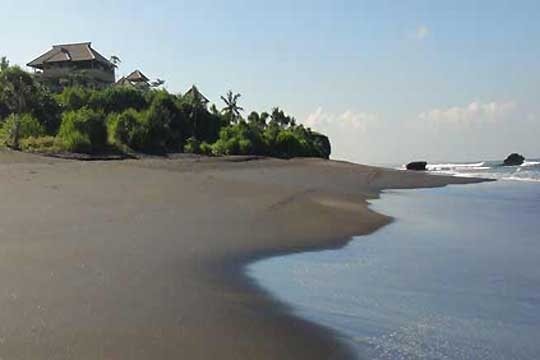 Below the villa, accessed via a steep descent down a stone stairway, is a lonely beach of glistening coal-black sand and a coastal panorama that extends all the way to Bali’s south-westernmost tip. On a clear day you can watch the sunrise behind Mt Agung, see Java to the west and relish spectacular sunsets over the ocean. The kitchen allows guests to self cater but the nearest supermarkets are a long way away so most folks choose to be pampered with delicious Western and Indonesian dishes prepared and served by an inspired home cook. A suggestion menu is provided and the staff will do the grocery shopping for the cost of the ingredients plus 30%. Ideal for a group of friends or a family (there are a number of built-in daybeds that serve as extra beds for children), Villa Sunset is one of four Kembang Desa villas, and can be rented on its own or in conjunction with one-bedroom Villa Moon, two-bedroom Villa Breeze or four-bedroom Villa Ocean, offering guests anything from a one-bedroom to a 13-bedroom renting option. All you will see is mountains, rice fields and the wide blue ocean. Of the four dwellings at Kembang Desa Villas this is the granddaddy family villa of them all and will definitely please the needs of any group, big or small. The views facing the ocean and the land are (almost) indescribably sublime with the power of the ocean to the front and the fecund bounty of the green rice bowl behind. We went for a long walk down the beach in the late afternoon and checked out temples and rock pools and a most glorious sunset. 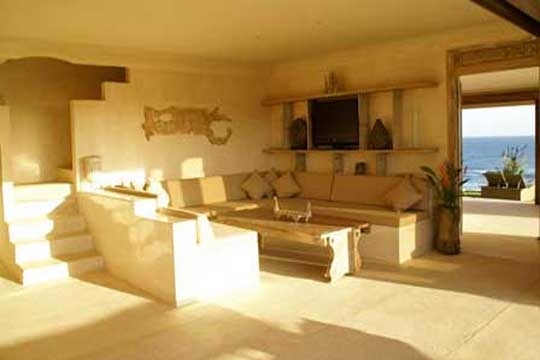 When we got back to the villa a delicious meal awaited – nothing gourmet, just honest, well-prepared food. 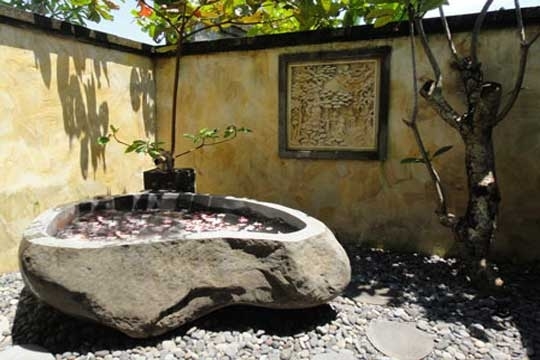 The cook produces meals from a tasty repertoire of Balinese / Indonesian / International dishes that hit the spot. The villa also has a collection of hundreds of digital movies – all without the evil scratch demon that can ruin the last five minutes of the most-engrossing films! Make sure you wake up early in the morning when the air and sky are at their most calm and be rewarded with a mountain vista that will leave you speechless. The roar of the ocean: the only sound you will hear and it’s guaranteed to accentuate the views like you wouldn’t believe. A huge movie selection with no scratches! A bit of a hike from the airport over some pretty questionable roads so you may not want to venture far from the villa once you are there. The ocean is a bit rough and there are no lifeguards so know your limits and play accordingly – remember, there’s always the swimming pool! 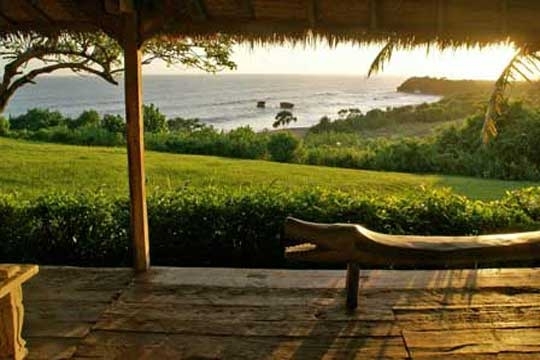 Villa Sunset at Kembang Desa is located on the beach, way, way out in Bali’s rural hinterland where self-containment is the order of the day. The nearest villages are ten to fifteen minutes away by car and there are no shops, restaurants or bars in this area. 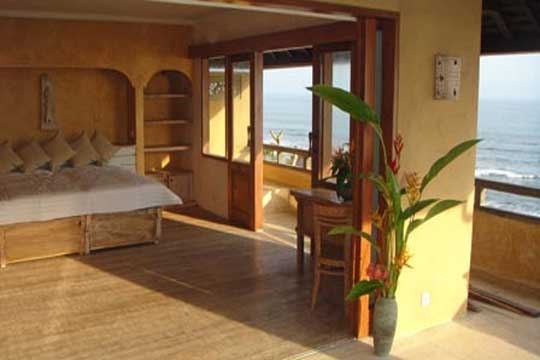 There are, however, occasional villas dotted up the coast, and the beach is right there, providing ample opportunities for exploring and walking, as do the surrounding rice fields. 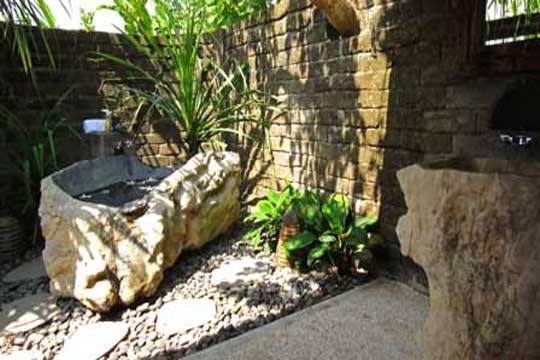 Getting back to nature is what it’s all about at Kembang Desa Villas! 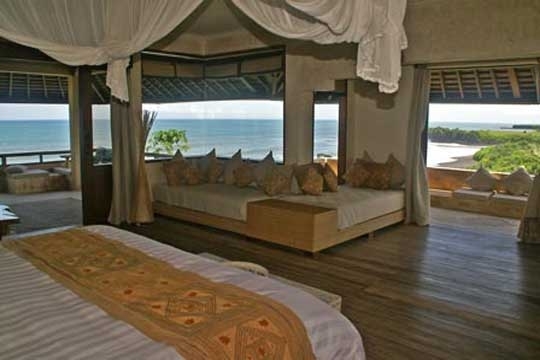 Villa Sunset is comprised of a main two-storey building flanked by a traditional wooden cottage from Java, which houses one of the six bedrooms. The main building is characterised by a shingle roof and Timorese carved furnishings and doors. Cooled by natural sea breezes, the living and dining room has glass doors that slide open to the sea and sunset views; the room is furnished with a built-in, U-shaped sofa and equipped with a large flat-screen TV with a digital movie collection. Guests can dine indoors on a table for 12, or on the open terrace – there is no escaping those views! 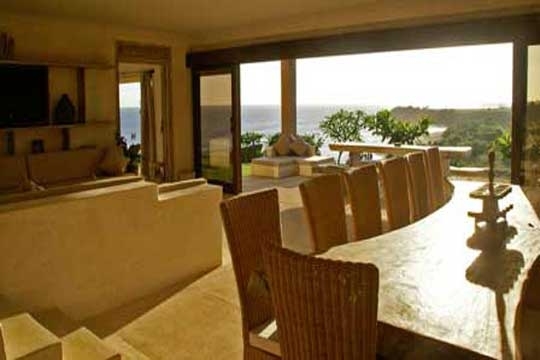 A fully-equipped, open-plan kitchen is situated on the far side of the dining area. There are five air-conditioned bedrooms in the main building, two downstairs and three upstairs, all with wardrobes and three with daybeds that convert to a child’s bed (extra cost). 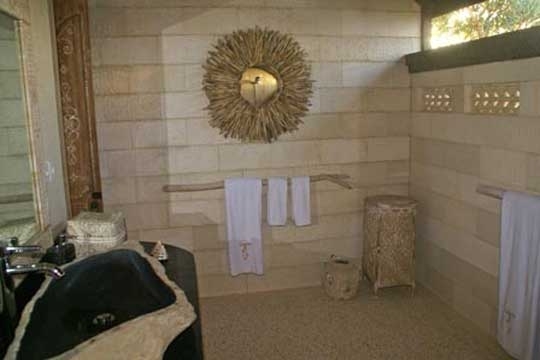 The ground floor master has views from its king-size bed of the swimming pool and ocean; its romantic open-air bathroom is fitted with a shower and a huge bathtub carved out of a river boulder. 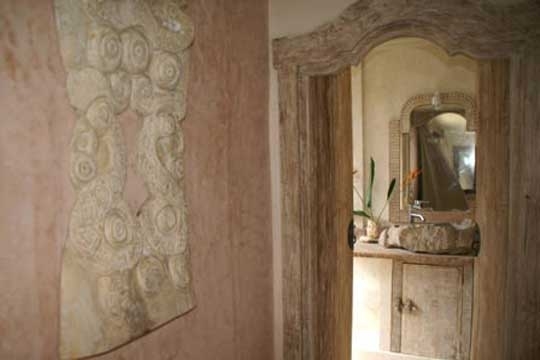 All of the other bathrooms in the main building have standing showers and washbasins hewn from either river rock or marble. The downstairs guestroom (complete with ensuite bathroom) has twin beds that can be converted to a king-size bed. The enormous upstairs master is furnished with a king bed, two daybeds and a desk and chair, it is complemented by a walk-in wardrobe and three huge open-air terraces, all with built-in cushioned sofas and one with a dining table with bench seats, plus views on three sides. 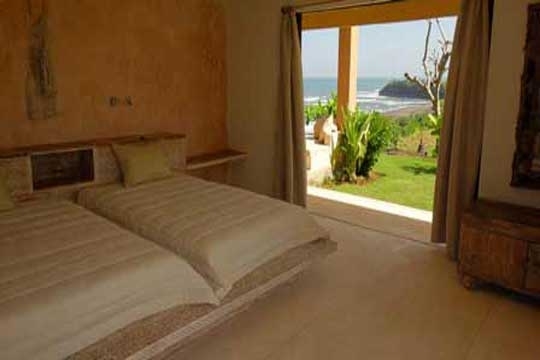 The master shares a semi-open-air bathroom with a twin-bedded room, making it ideal for families. There is another king bedroom, with ensuite bathroom on this floor. 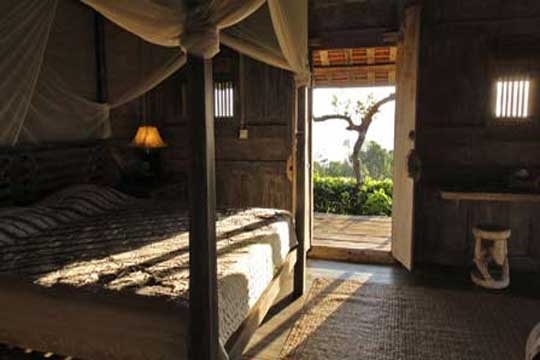 The sixth bedroom, resting a few paces from the main building, offers a romantic experience in the antique Javanese house. 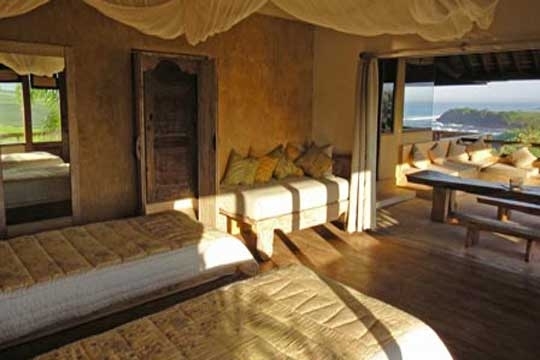 The air-conditioned wooden building is furnished with a king bed under a high roof and has a raised veranda on two sides, as well as a bathroom in a private courtyard, which is fitted with a shower and a huge river rock bathtub under the stars. .
Villa Sunset’s cliff-top garden presents a smooth lawn, a 17m lap pool and two balé pavilions for relaxing or dining. 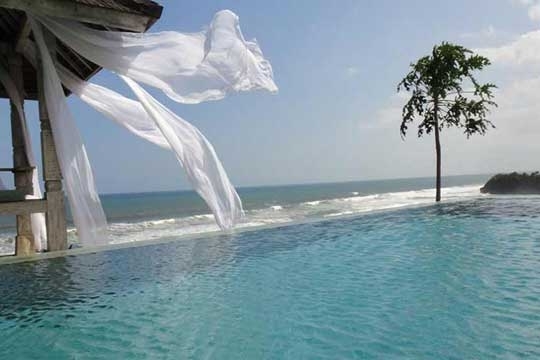 6 bedroom villa located in Tabanan, Bali. Ideal for Beach in ten, Beachfront, Body and soul, Bring the relatives, Kid friendly, Going for golf, Fair share for groups, The great outdoors, Sensible for seniors, Room with a view, Perfect for weddings.